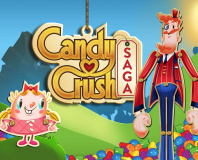 Candy Crush Saga developer King.com has been accused of blatantly cloning a rival title, despite the company's heavy-handed approach to protecting its own games and trademarks. A developer of so-called casual games, typically employing the 'pay-to-win' variant of the freemium model, King.com is a giant in the industry. Recently, however, it has turned to bullying competitors with legal threats, most absurdly surrounding its claimed rights to such generic terms as 'Saga' - attacking rival Stoic over its otherwise completely distinct game The Banner Saga. Now, independent developer Matthew Cox has stepped forward to claim that King.com directly cloned a game he developed with Nick Bray following talks regarding licensing the title - a far more serious case of infringement than a simple trademark disagreement. In a post to his website, Cox claims that he and Bray approached King.com's Lars Jörnow in 2009 with a view to licensing the title Scamperghost, a Pac-Man derivative which re-imagined the title as a rapid-action mouse avoider. Talks went well, but prior to the contracts being signed the developers received a better offer from one of King.com's competitors - and, naturally, went where the money was. That's when King.com is accused of hiring development house EpicShadow to produce a direct clone of Scamperghost. The company has admitted to doing so at Jörnow's request, claiming that it was told that contracts had been signed giving King.com rights to the game but that Cox and Bray had broken those contracts - something Cox strongly denies. The result was Pac-Avoid, a near-exact clone of Scamperghost featuring the same mechanics and visual styling. As well as cloning a competitor's game outright, the title - Pac-Avoid - arguably infringes on Namco's rights to the Pac-Man trademark, an argument King.com is attempting to use against its own rivals. While the game has been removed from the company's website, it has not provided an explanation for how it could come so close to infringing on Namco's Pac-Man trademark if it did, indeed, perform searches, and nor has the company commented on confirmation from Pac-Avoid developer EpicShadow that the company did indeed request a direct clone of the game. 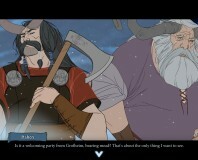 This Viking adventure truly lives up to the word epic.